From Anchorage (100 Miles) allow 2-2.5 hours. Construction delays may be present. For highway conditions call 907-273-6037. Take the Seward Hwy south (Hwy 1) from Anchorage. At the junction with the Sterling Hwy, turn right toward Soldotna/Kenai/Homer. Cooper Landing begins 10 miles from the Junction. From Seward (50 Miles) allow 1 to 1.5 hours. Take the Seward Hwy north to the junction with the Sterling Hwy. Turn left and proceed to Cooper Landing. 2.5 - 3 hours. Take the Sterling Hwy north to Cooper Landing. It is almost impossible to get lost driving in Alaska, because there are simply very few roads. It is very easy to get around and the scenery along the highways is fantastic. 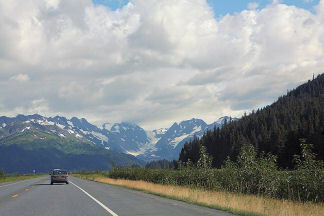 Most guests arrive in Anchorage and rent a car. A few folks take a short commuter flight to Kenai and start from there. If you are coming to Alaska by cruise ship, you will be arriving in Seward or Whittier. Kenai River Boat Landings and directions including mile markers. Nestled in a valley on the shores of Kenai Lake and extending a few miles past the outlet where the Kenai River officially begins is the small town of Cooper Landing. Joseph Cooper, a miner who struck gold in the area in 1884, became the towns namesake. I can remember my first summer in Cooper Landing. One afternoon as I was gazing between the snow etched face of Cecil Rhode Mountain and the rushing turquoise waters of the Upper Kenai, I could not stop grinning. It's a feeling that has never left me. 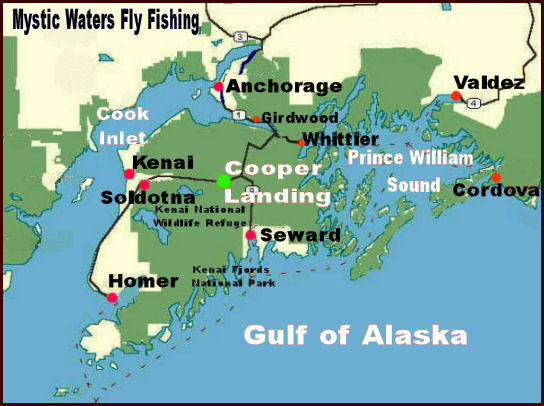 Cooper Landing is located right in the heart of the Kenai Peninsula. For tourists, it is an ideal destination from which to base their adventures. Within 50 miles, one can view all the unique features that make Alaska a special place such as the Pacific coastline, mountains, volcanoes, glaciers, tundra, rivers and wildlife. The boundary of the Kenai National Wildlife Refuge, almost 2 million acres of designated wilderness, begins at the Kenai / Russian River confluence. Kenai Fjords National Park and Resurrection Bay can be accessed from nearby Seward, 45 miles away. Heading downstream, the town of Soldotna can cover various shopping and service needs as well as access to the Lower Kenai River. The confluence of the upper Kenai and Russian rivers was once an important summer gathering area for the Dena'ina Indians. Now it is known worldwide for Sockeye Salmon. 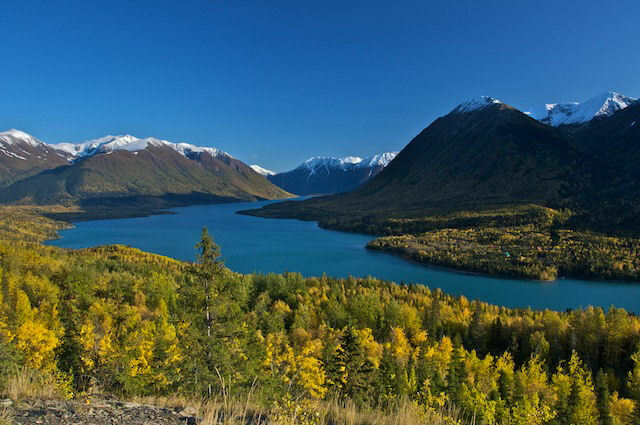 This area along with the entire upper Kenai River is without a doubt, the largest draw for Cooper Landing visitors, both Alaskans and tourists. Visitors can choose to stay at one of three national forest campgrounds, two RV parks, the Kenai Princess Lodge, several motels, B&B's and a variety unique cabin and home lodging options. When not on the water, there are several restaurants to fuel up. Fare ranges from burgers and halibut sandwiches (my favorite), to prime Alaskan seafood and of course tasty Alaskan beers. In short, Cooper Landing has what an angler needs and plenty of it. © Mystic Waters Inc., You must obtain written permission to use any content from this website.